NO GUTS, NO GALAXY is a weekly series of artist-curated slideshows that expand upon the diverse subjects addressed in RAMMΣLLZΣΣ: Racing for Thunder, such as, the Downtown scene, early hip-hop and performance, Afrofuturism and cosmology, the mythology of Gothic Futurism, and the coercive power of language. Event Description: The Ramm Riff is a layered experimental composition, part manifesto, part oriki praise song/citation poetry, a call-and-response with The Rammellzee’s Garbage Gods. Led by Black Light Primal Nun “A” through hallowed virtual halls of Gothic Futurism and Afrofuturity, this audience-interactive lecture-performance weaves through space and time to illuminate histories of African-centered masquerade and mythologies; rituals of the body in clay, hair, soil; assemblage and costuming the cosmic android in the detritus of consumer culture; hauntology and becoming Spirit (in the) Machine; language and code systems as weaponized methodologies of decolonization; and the train as vessel of liberation. D. Denenge Duyst-Akpem is space sculptor whose visual art, writing, performance, and teaching bridge the disciplines of site-specific, ritual, public art, interior design, ecology, and Afro-Futurism. 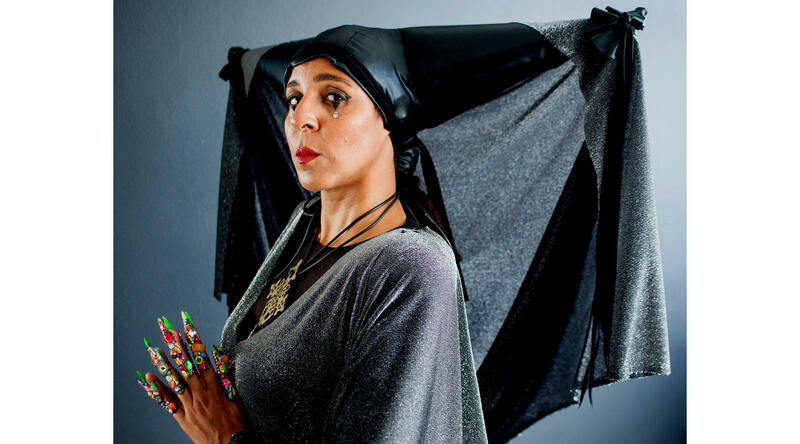 She meticulously constructs fantastical interactive Afri-sci-fi environments and projects to interrogate, titillate, decolonize, and empower, rooted in Sun Ra's transformational legacy, asking "Who controls the future?" Her practice is concerned with themes of incarceration and liberation; surviving and thriving in the apocalyptic landscape; and environmental consciousness. Photo Credit: D. Denenge Duyst-Akpem as Black Light Primal Nun "A" for The Ramm Riff, 2018. Photo credit: Tonika Johnson.